No business owner can afford avoiding SEO anymore. The harsh reality of the current business landscape is that you can have the best business in the world and still get only a fraction of the clientele of a well-marketed company. 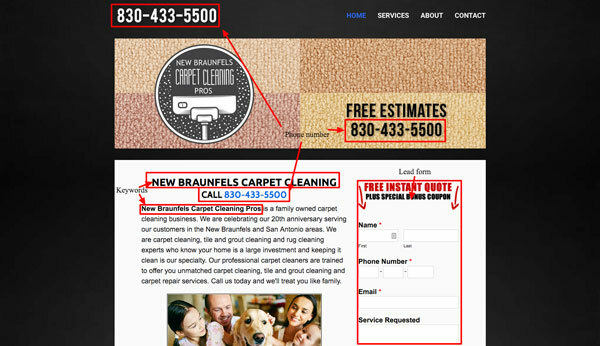 I’m going to use one of my clients, New Braunfels Carpet Cleaning Pros (http://www.newbraunfelscarpetcleaningpros.com) as an example to show you. Therefore, there’s no time like the present to learn what SEO is all about. The acronym stands for ‘search engine optimization’ and it’s self-explanatory – SEO is all about fine-tuning your online presence so that search engines show you favor. Well over half of your future clients are bound to find you through the internet, so you can’t pass up on the world’s largest and most influential business medium. Keywords as H1 tag and bolded in the 1st paragraph. Lead form so your customers can contact you. Google and other search engines rank your business based on how important they feel you are, and the perceived value of your site. Say you own a carpet cleaning company: wouldn’t it be nice if a search for ‘carpet cleaning’ turned up your company as the very first result? If you’ve never had SEO done, however, you’ll probably have a hard time ranking even when people search for a company of your type in your specific area. Don’t worry, though: you can fix it all through some hard work and a lot of insight. Going back to the aforementioned presence, think about the places on the web where your voice can be heard. No, we don’t mean spam – that will only cause you to plummet down the rankings further. Instead, think about offering something of value on sites that already rank well in order to leech a bit of their status. For example, you can throw a couple of guest posts on high-ranking sites related to your niche. These pieces should be full of insight and knowledge – the kind of information that will be useful years from now. You ‘sign’ the post with your name, brand name and business website, and you’re all set – once Google recognizes that people are reading and sharing the post (and going to your website to see what it’s all about as a result), your rankings will automatically increase. This is merely one way of improving your SEO standing, although it’s an important one – you’ll get much of your best results by using some variant of the aforementioned procedure. Yet SEO isn’t all about spreading out and becoming known – there’s also something to be said about fixing things closer to home. Plenty of websites belonging to smaller businesses lack proper SEO optimization. In so many words, SEO optimization means understanding what Google looks for when indexing pages and adjusting your website as a result. Optimizing your website can be just as effective as making some high-quality posts that generate a lot of traffic, and it’s also a lot more straightforward. That being said, you’ll need to do some searching in order to find every last setting to tweak – if you had your website done by a designer, try asking them about improving the search rankings. Don’t forget online citations, either – having your info correctly listed on various citations sites will make a huge difference. It’s not just about people finding you more easily through them – Google routinely boosts properly-cited sites, so be sure to take your time with this step.